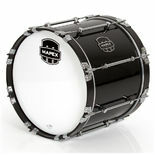 Mapex Quantum Marching Bass Drums represent a significant advancement in design and function. Progressive air vent placement and width differences allow for a more consistent sound and feel throughout the bass ensemble. All Bass Drums are outfitted with chambered aluminum hoops that provide strength and stability while eliminating the need for additional rim protection. Lightweight, aluminum tube lugs with stainless steel threaded inserts minimize shell contact while ensuring the best possible alignment of tension rods to keep tuning stress off the shell. 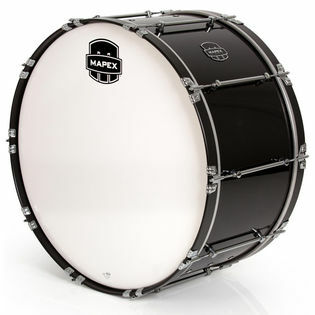 One of the most exciting elements that make the Mapex Quantum Series Marching Bass Drums stand above the rest is a few simple, yet very effective design features incorporated into the lineup of sizes. 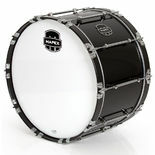 The very simple principle that as the size increases, so should the number of air holes in the drum has long been ignored in the marching bass drum venue. The 14" Drum has 1 air hole while the number increases with each larger size up to the 30" having 12 air vents. Another feature in the design of the Bass Drums is the idea that larger diameter sizes should also be wider. This allows an incredible amount of tonal spread to occur to allow each size drum to "open up" and be able to be tuned in it's own perfect tonal range. The 14" thru 24" sizes have a width of 14", the 26" and 28" have a width of 15" and the 30" is 16" wide.